Received November 16, 2016; Revised December 20, 2016; Accepted December 21, 2016.; Published online December 29, 2016. Fig. 1. Schematic diagrams of local translation in dendritic spines and an axonal growth cone. (A) Illustration of mRNA localization in a neuron. (B) Localization of mRNA in dendritic spines. Translation of β-actin mRNA is repressed by ZBP1 during transport to the localization site. After translation, newly synthesized β-actin proteins accumulate at the periphery of the spines. 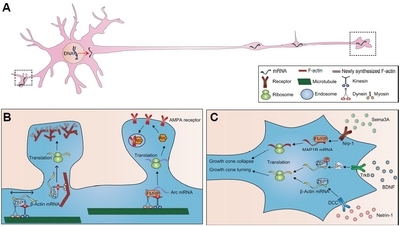 Arc mRNA localizes selectively at active synapses and mediates local synthesis of Arc proteins, which play a role in AMPA receptor endocytosis. (C) Localization of mRNA in an axonal growth cone. BDNF and netrin-1 induce local translation of β-actin mRNA, which mediates growth cone turning toward extracellular cues. Sema3A induces local translation of MAP1B mRNA, which leads to growth cone collapse. Fig. 2. Schematic diagrams of the TRICK and Suntag (or FLAG)-MBS systems. (A) Schematic of the TRICK system. Both PCP-GFP and MCP-RFP are bound to the untranslated mRNA. During translation, ribosomes read through the PBS sequence and knock off PCP-GFP from the mRNA. After the first round of translation, the mRNA is only labeled with RFP. (B) Suntag (or FLAG)-MBS system. 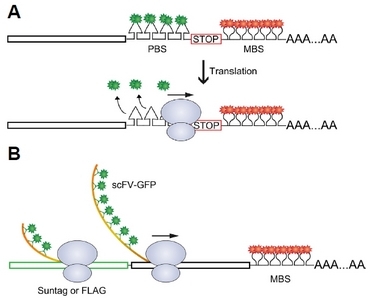 Translation of RFP-labeled mRNA can be monitored by the fluorescence signal from scFV-GFP clustered on the nascent polypeptides of Suntag (or FLAG). Chao, J.A., Yoon, Y.J., and Singer, R.H. (2012). Imaging translation in single cells using fluorescent microscopy. Cold Spring Harb Perspect Biol. 4. Moon, H.C., Lee, B.H., Lim, K., Son, J.S., Song, M.S., and Park, H.Y. (2016). Tracking single mRNA molecules in live cells. J Phys D Appl Phys. 49.